Journalists covering a disaster always keep an eye out for a good-news story  a tale of heroism, of human kindness, of happy serendipity. We do this because it is important for readers to know that even amid appalling tragedy, there's hope. But we also do it for ourselves: we desperately need to look away from the horror and carnage around us and find something to lift our own spirits. Every once in a while, a journalist gets to play a part in a good-news story. Sometimes it's a starring role: CNN's Dr. Sanjay Gupta performed brain surgery on a Haitian girl aboard the U.S.S. Carl Vinson. Other times, it's an uncredited part: countless reporters and photographers have put aside their notebooks and cameras to help medical teams in emergency situations, or to dig survivors or bodies out of the rubble. But big or small, every opportunity to contribute outside of our journalistic tasks brings an enormous gratification. That's why our little group  made up of TIME.com producer Natasha del Toro, videographer Carmen Gentile and me  was so exultant on Saturday, when we finally tracked down France St. Fleur. Our task would have been mundane in most places: we were to take a small envelope of money to her from a grandniece, Alexandra Sheils, who lives in New York. 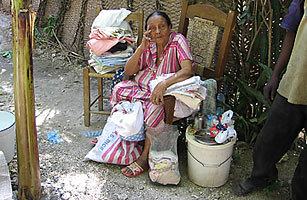 But in quake-ravaged Haiti, our chances of finding her were not great. When Sheils and her mother Bernadette first heard of the quake, they feared the worst. They knew St. Fleur, 94, lived in a two-story cement-and-cinder-block house in the small beach town of Gressier, sandwiched between the two worst-hit cities, Port-au-Prince and Léogâne. "My mom and I were scared that she wouldn't be able to survive any injuries because [of her age] and we were especially concerned that she would be left alone to fend for herself in the chaos," Sheils said in an e-mail to me. "We didn't know whether or not anyone was with her during the quake." Sheils posted messages on Haiti911.com seeking information from Gressier, hoping for good news but just wanting to know something. Watching the tragedy of Haiti unravel on TV, she and her mother prepared for the worst. Then they got a lucky break: a friend in Gressier sent word that St. Fleur was alive. Her home had been badly damaged, however, and she was living in a tent. Two other cousins had died and one needed to have a leg amputated. Then Sheils learned from her roommate, a TIME staffer, that we were going to Haiti. She asked if we could take some money to her grand aunt, and we promised to try our best. But we didn't think our chances were very good. Given her age, we could not be certain how she had coped with the shock of the quake, the distress of losing her home and the hardship of living in a tent. We weren't even sure we could get to Gressier: early reports said the road south of Port-au-Prince had been badly damaged. It was five days before aid convoys even got to that part of the country. When we finally reached Gressier on Saturday morning, the town seemed to be coming to terms with the quake. Some shops and food stalls had reopened. But the police station  where we were hoping to get some help in finding St. Fleur  had crumbled. Sheils had told us that her grandaunt lived near a school, but when we found it, it too was rubble. Our hearts sank: Could a 94-year-old woman have survived all this? When the first few people we asked didn't know her, I worried that we would have to return to New York with Sheils' package undelivered. Then, another lucky break: at a small shop near the school, we found someone who thought he knew "the old woman" and thought that she had survived the quake. He led us down a gravel path into the cul-de-sac where St. Fleur's home lay in ruins. But in the yard was a makeshift tent made from green tarpaulin. And sitting outside, a tiny woman, clutching some laundry. It was France St. Fleur. Given her circumstances, St. Fleur was in good health  and jolly spirits. Her tent was roomy, she said, and neighbors were helping to get her food and water. The house would have to be rebuilt, of course, but she didn't seem fazed by that prospect. And although she didn't remember her grandniece, she was delighted that someone had thought to send her help from so far away. "Tell her I'm fine, and I send my love," she said, beaming. It was a brief encounter, no more than 15 minutes in a day packed with powerful images  a child's body abandoned in the corner of a street, the corpse of a man shot by the police, the utter devastation of Port-au-Prince and Léogâne. But the one that will stay with me forever is of a little nonagenarian's toothless smile as she shook my hand, still clutching her laundry in her other hand.